Beston amusement will present you a new kiddie amusement rides – kiddie robot ride for sale in Australia which is attractive to kids. It has been one of the most popular amusement park rides for kids. There is only one seat in the central which means it is a one seat amusement ride. But the seat is big enough to hold one adults and a child. Interested? Contact us to buy some robot rides for your business. Amusement park robot rides, a new design amusement rides which is designed for Australia Parks by our professional designer and manufacturing by our experienced workers. 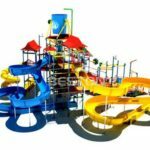 This amusement ride is one of the most popular attraction in the amusement park, theme park, Kiddie Park, and some storefront places. They could walk just like people and also drift spin. The robot ride is easy to operate and maintain. It is safe to kids and has stable performance. With its beautiful design and attractive appearance, the robot ride is suitable for the park and large squares, shopping centers. Robot amusement rides need little space only the ground is flat, it will work. Little drivers could drive these rides easily. Because we also call it the passenger-carrying robot, when we need to move this ride, we could ride on the robot and then move it away. So much more convenient? Just like the trailer model rides. Beston passenger-carrying robot rides are operated by dual rocker, passengers could control the direction freely, backward, and forward, rotate within 360 degree. All of these action is easy to the robot ride. Robot ride equipped with music play function, we could insert SD card and passengers could change songs by his own mind and adjust the volume by themselves. There are two batteries which will extent the working time for passengers. Also the handsome appearance of these robot rides will draw the attentions of kids and adults. The attractive point of Beston robot amusement rides is coming from a film which called “transformers”. This particular theme makes our robot ride popular in the amusement rides industry. The passenger-carrying robot amusement rides is filled with exciting and interests. Drivers could move this robot ride forward and backward or spin in 360 degrees. There is a SD card inside the MP3. When driving the amusement rides, the robot could play different songs. Because of colorful appearance, led lights and cool and unique design, Beston robot ride has become more and more popular. They are suitable for kids and adults and other different age groups. If you are interested our robot rides, just contact Beston Amusement Equipment to buy sets of robot for your park! If you need kiddie amusement rides for your business, why not consider kiddie robot? It is Suitable for Funfair, Square and Amusement Parks In Australia. If you need, just contact us by Email: sales@australiaamusementrides.com. Or send your inquiry beside the model you need. We will contact you back as soon as possible.